Just like pairing food and wine, I like to pair food with movies. For Slumdog Millionaire it was curry for dinner, with Mamma Mia it was Greek, for Finding Nemo it was sushi. Julie & Julia was no exception. I made a pact with my foodie friends Peggy and Sandra to watch the movie together and suggested we go to a local French restaurant afterward. No? What was Peg thinking? I’ll tell you what she was thinking. She called the executive chef at her Chalk Hill winery and asked if he would cook a four course French meal for us following the film. We saw the 2:00 Sunday matinee in a packed theater. The movie was wonderful although it did leave me hungry for more of Meryl Streep’s impeccable performance. When we arrived at Chalk Hill we were greeted with 1996 Veuve Clicquot La Grand Dame champagne in honor of Julia Child. After the toast I presented my pals with their own copy of Mastering the Art of French Cooking to commemorate our homage. We nibbled h’ors d’oeurves and chatted about food – buying it, cooking it and eating it. Just like Julia. Then the piece de resistance. Chef de cuisine Didier Agoerges announced that dinner was ready. The first course was petits farcis de Provence. Loosely translated that is small vegetables stuffed with vegetables. Tiny turbans of squash, mushrooms, tomatoes and eggplant nicoise-style. There was still so much to come yet I couldn’t control myself and I devoured it all. 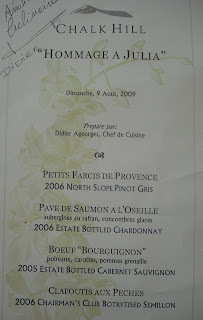 Next we were presented fave de saumon a l’oseille. Fancy words for salmon with sorrel sauce. Accompanying this was braised cucumbers sauteed in butter, a textbook preparation made just like Julia would. Don’t wince until you try it. Cucumbers are delicious cold, but served warm they take on a new texture and they balanced the sorrel beautifully. Our third course was boeuf bourguignon. Talk about theming. This was the perfect entree both in choice and execution. I was trying to pace myself but I was already getting full. I wondered if it would be rude to ask for a doggy bag? The server ignored my subtle suggestion so, no, I did not have boeuf bourguinon for breakfast the next day. C’est dommage. For dessert we had clafoutis aux peches. You don’t need to speak French to understand peaches but do know every time you see clafoutis on a menu you’re in for fruit, cream, milk and eggs. Magnifique! I am a servantless American cook. Four course French meals served by professionals and eaten on fine china with cloth napkins is not my every day experience. I am an ordinary person that takes great pride in preparing meals for my family and friends. Previous Post Gilroy Garlic Festival!